A week and a half or so ago I posted pictures of our Russian Mammoth Sunflowers. The kids really have enjoyed watching them grow this summer and now the seed head are starting to dry. 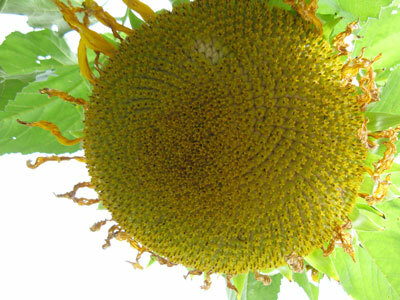 Sunflower seeds grow in an interesting spiral pattern, and this pattern follows the Fibonacci sequence. 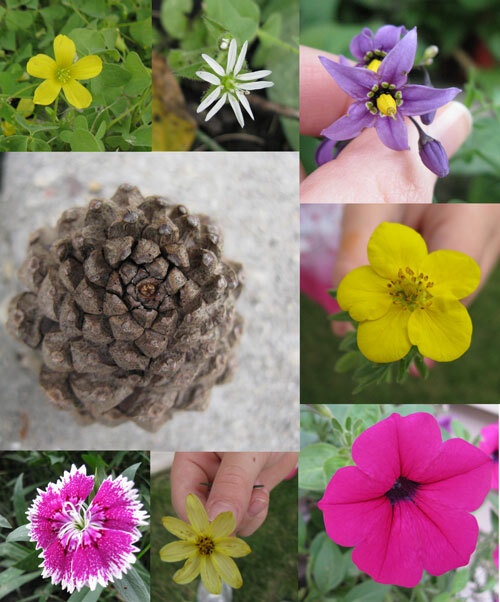 We had fun learning about the Fibonacci sequence this weekend and observing the pattern in nature by looking at seed heads, flower petals and pine cones. Although my kids are pretty little yet, they are not too young to understand patterns, count petals or observe spirals. However, the math behind the Fibonacci sequence is a little beyond their abilities just yet. First we observed the spirals by looking at one of the sunflower seed heads in our backyard. We counted (or rather I counted) the spirals going to the right. The spirals totaled 55. We tried to count the spirals going left, but lost track. I didn't want to cut the sunflower head off just yet because this year we want to watch the heads dry naturally outside. The counting would have been much easier if we would have taken the head off and sat it on a flat surface. 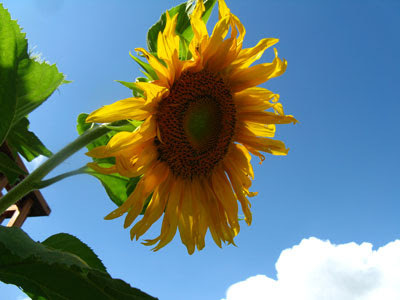 According to the "Fibonacci Fun" article in this month's KNOW Magazine, "different kinds of sunflowers have different numbers. The pairs might be 34 and 55, or 55 and 89, or 89 and 144." After observing the sunflowers, we went on a Fibonacci nature hunt in our backyard. We counted the petals on many of the flowers and noticed several that had a Fibonacci number. Many of the flowers we found had 5 petals, and one had 8. We found a white flower with 10 petals (not a Fibonacci number) but when we looked more closely we noticed that the flowers petals were arranged in a star pattern with 5 points (a Fibonacci number). Not all flowers have a Fibonacci number of petals. We also observed the spirals in a pine cone (above) and a Black-eyed Susan flower seed head (left). 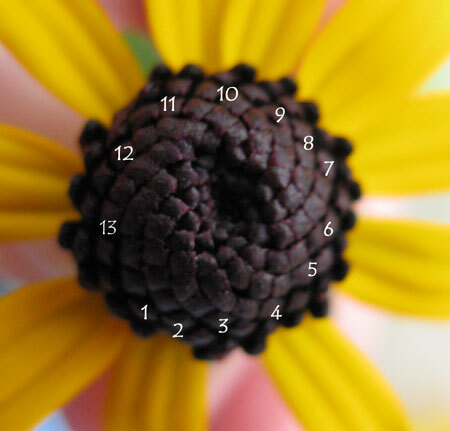 Later on we numbered the Black-eyed Susan spirals going counter-clockwise, counting 13 spirals. The spirals going the opposite direction number 21 spirals, if you'd like to try counting them yourself. I wish I knew the names of all the flowers we found - some we planted (Potentilla, Petunia) but a few of them are weeds and I don't know their names. When the kids get a little older, we'll probably revisit this math/science activity and spend a little more time on the details. Older kids would probably enjoy creating a chart to document the different Fibonacci numbers of each plant. But, for now, the kids had enough fun counting petals and going on a Fibonacci nature hunt. ISU Extension - Growing in the Garden Sunflower Activities! If you enjoyed this post you can find more Science Sunday experiments involving kids at http://adventuresofmommyness.blogspot.com/2010/09/science-sunday-more-flooding.html or even join in the weekly meme. Science is Fun! I *love* this project! Thanks!!! Wow, super cool! My son is too little for understanding the concept too, but I have starred it in my google reader for future use. Thanks! I always loved Fibbonacci once I learned about it in school. I think it's so cool that you're showing it to them this young, impressive. wow this is new to me, looks like you guys had fun :) I will definitely try this out sometime! What a great project and concept to be teaching your kids! I'm going to remember it in a couple of years when my little guy is a bit older. That is an amazing lesson...the world is so cool.